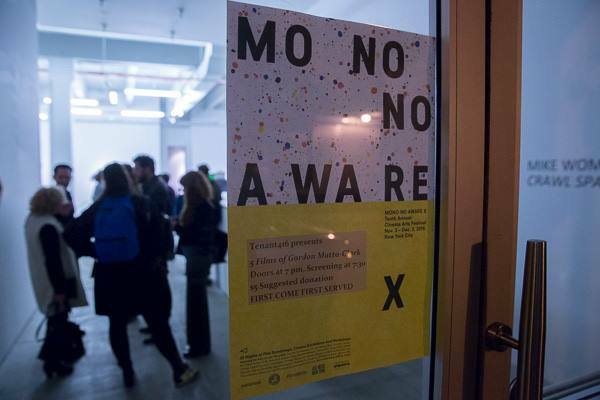 "MONO X: Five Films of Gordon Matta-Clark"
Co-Presented by Samuel Adams of Tenant416 and MONO NO AWARE. Courtesy of the GMC estate. Co-director of the Estate of Gordon Matta-Clark, Jessamyn Fiore, will generously, introduce the program as well as each film individually, followed by a Q&A. Tenant416 is honored to present five films of Gordon Matta-Clark, widely considered one of the most influential artists working in the 1970s. His practice introduced new and radical modes of physically exploring and subverting urban architecture, and some of his most well known projects involved laboriously cutting holes into floors and walls of abandoned buildings. Often overlooked in otherwise illuminating texts and exhibitions that focus on Matta-Clark, his films add immeasurably to our understanding and appreciation of the inimitable artist's ability to shift the spatial, temporal, and philosophical ground beneath us. The five films presented have been carefully selected to reveal not only the breadth of his architectural interventions and performances, but also the artist's interest and gravity towards avant-garde filmmaking.